Fan Parker and Stephen Jan Parker, Russia on Canvas: Ilya Repin (University Park-London: Pennsylvania State UP, 1980). Repeats the standard Soviet interpretation of Repin's life and work. 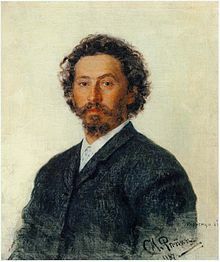 Grigory Sternin and others, Ilya Repin: Painting Graphic Arts (Leningrad: Aurora, 1985). Standard Soviet treatment, but well illustrated. Elizabeth Kridl Valkenier, Ilya Repin and the World of Russian Art (New York: Columbia UP, 1990). Critical non-Soviet treatment with much fresh information, but geared primarily toward academics.